The Aquincum Museum, located in Budapest the capital city of Hungary, is currently hosting an exhibition dedicated to Hadrian to commemorate his accession to the throne 1,900 years ago. The exhibition, part of Aquincum’s “Hadrian’s Year 2017” program, is being hosted in the old museum building located in the centre of the Archaeological Park. It presents various themes and some of the most important aspects of Hadrian’s life and introduces a number of items found in Aquincum never displayed before such as weapons, coins and everyday objects. 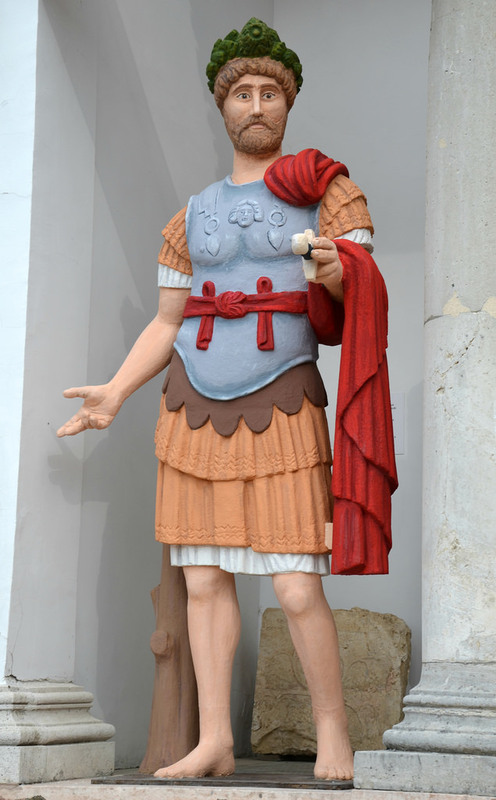 For the occasion, the Aquincum Museum created a painted replica of a full length statue of Hadrian, similar to the work done on the famous Augustus Prima Porta. Hadrian is dressed with a red toga, a white and ochre tunic and a breastplate bearing a gorgoneion (Medusa’s head). A cingulum (military belt) is wrapped around the waist and tied at the front in an elaborate knot. Hadrian wears the corona civica (civic crown). The statue reminds me of the one from Perga which is on display at the Antalya Museum in Turkey. Painted replica of a full length statue of Hadrian. Before the Roman town of Aquincum was founded, the site was settled by the Eravisci, a Celtic-speaking population who were organised into self-governing communities. With the Roman troops advancing to the Danube section, the territory was annexed to the Roman Empire under the name of Pannonia. A frontier system with fortified military camps (castra), fortlets (castella) and watchtowers built by the Roman army on both sides of the Danube protected the Pannonian provinces against attacks from the dangerous barbarian tribes of the north. Civilian settlements, predominantly for veterans and former legionaries were also built. Aquincum was located at an important Danube crossing and served as a military base as part of the Roman border protection system. A Roman cavalry fort of roughly 500 strong auxiliary troops was established near the west bank of the Danube River during the reign of Tiberius. In 73 AD, the Roman frontier was reinforced by Emperor Vespasian and a new permanent camp was built in Aquincum. Later in 89 AD the army started to build a legionary fortress (castra legionis) and around 6,000 soldiers and 500 cavalry were stationed there. Eventually a Roman civilian settlement developped exactly one mile from the camp. The excavated ruins of the city can be visited today in the Archaeological Park of the Aquincum Museum. Reconstruction of the settlement complex of Aquincum. The first part of the exhibition presents Hadrian’s early military career which started in Aquincum. Hadrian’s first contact with the area came in 95 AD when, aged 19, he began his military career serving as tribune with the Legio II Adiutrix stationed at Aquincum. 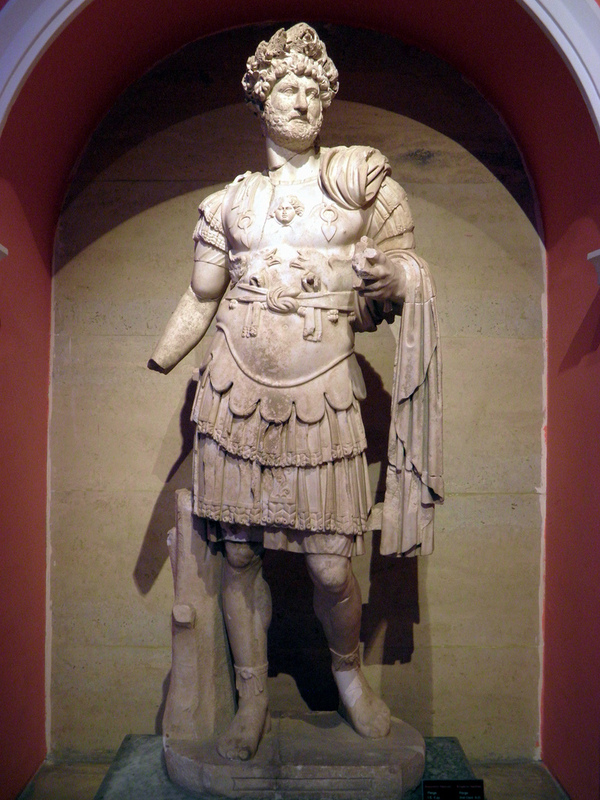 As tribunus laticlavius Hadrian served right under the legionary commander (legatus). With no military experience of his own, his primary duty would have been to learn the business of soldiering from the centurions and the other tribunes. The first room of the ‘Hadrianus MCM – History of an Ancient Career‘ exhibition. The Legio II Adiutrix, formed in 70 AD by Vespasian, was transferred to Aquincum from Britain in 89 AD and remained there until the 4th century AD. The permanent legionary fort was built around this time and Hadrian would have used accommodation within the fort and probably even had his own house with slaves and freedmen at his disposal. Among the objects on show at the exhibition are a fragment of a roof tile stamped with the name of the second legion and the tombstone of C. Castricius Victor who served in the II Adiutrix under the command of Quintus Marcius Turbo. Turbo would later become one of Hadrian’s close friends who would serve him as Guard Prefect for over fifteen years. It was probably in Aquincum that the two men first met. LEG(ionis) II AD(iutricis) P(iae) F(idelis) QUAD(us?) F(e). Tombstone of C. Castricius Victor, soldier of the Legio II Adiutrix in Aquincum, around 90 AD. At some point in 96 AD Hadrian was sent to Lower Moesia so his time at Aquincum with the II Adiutrix lasted no much more than a year. But Hadrian’s relationship with Aquincum did not stop there. In 106 AD Trajan divided Pannonia into two provinces. Carnuntum became the capital of Pannonia Superior and Aquincum the capital of Pannonia Inferior. Ten years after its first service at Aquincum, the 30 year-old Hadrian became the first governor of the newly-created province of Pannonia Inferior (legatus praetorius). Reconstruction drawing of the legionary fort of Aquincum. It was at this time that Hadrian had his governor’s palace built on the island on the Danube, now called Hajógyári Island (Shipyard Island). Excavated in the 1950s, this was a large and lavish villa, centrally heated, decorated in painted stucco with mosaic floors. Hadrian’s successors repeatedly rebuilt and enlarged the palace, taking its final form during the Severian period in the beginning of the 3rd century AD. When Hadrian came back to Aquincum as emperor, he would stay in the palace. Reconstruction drawing of the Governor’s Palace of Aquincum where Hadrian once lived. The palace, surrounded by a wall, included the residence of the governor, the reception halls, the service rooms and warehouses. In the middle of the inner courtyard stood the sanctuary of the imperial cult where a fragmented statue of an emperor was found. The finds, mosaics and frescoes from the governor’s palace, are exhibited in the Aquincum Museum. The hall of the Governor’s Palace, Aquincum Museum. Dio Cassius also alludes to such exploits and refers to the Batavians, the emperor’s personal horse guards, and their river-crossing abilities. Aquincum was of special interest to Hadrian. As recorded by several ancient sources, Hadrian returned to Pannonia and Aquincum later during his reign. In the early 120s he rose the city’s status to that of municipium and the town’s name was changed to Municipium Aelium Aquincum. Aquincum had to wait until 194 AD during the reign of Septimius Severus to reach the level of colonia (colonia Aelia Septimia). Reconstruction drawing of the civilian town of Aquincum. The second part of the exhibition focuses on Hadrian’s travels in the provinces as well as his building projects like the Pantheon and the Temple of Venus in Rome and his magnificent imperial villa at Tivoli. A video made by The Digital Hadrian’s Villa Project and the Virtual World Heritage Laboratory invite the visitor to see 3D restorations of the main buildings of the Villa. The second room of the ‘Hadrianus MCM – History of an Ancient Career‘ exhibition. I was very honoured to be asked by the director of the Aquincum Museum, Orsolya Láng, to contribute to the exhibition with some of my photographs of Hadrianic buildings. They illustrate two panels dedicated to Hadrian’s travels to the provinces (Jerash, Ephesus) and his Villa in Tivoli. ‘Hadrianus MCM – History of an Ancient Career‘ exhibition. The Aquincum Museum and the surrounding open air archaeological park feature the biggest collection of Roman era findings of Hungary. It is also the most complete Roman civilian town in the country. The archaeological park of 10 hectares encompasses one-third of the ancient civil town where visitors can explore its houses, public bathhouses, courtyards, its market, its two Mithraea as well as a recreation of a Roman painter’s dwelling. Adjacent to the archaeological park are the remains of the civil amphitheatre and the aqueduct. Overview of the remains of the civil town. The restored remains of the market (macellum). The entrance opens onto the colonnaded porticus of the open courtyard with shops and storerooms along the four sides. The civilian amphitheatre located outside the municipium. It was built during Hadrian’s reign and completed in 162 AD. It could seat 6,000 to 7,000 people. The reconstructed section of the Roman aqueduct. The new Aquincum Museum building holds restored mosaics and wall paintings from excavated ancient Roman buildings and showcases a vast collection of Roman daily life objects. The fragmented bronze remains of a 3rd century hydraulic water-organ are among the main attractions at the museum. The five lapidariums exhibit stone finds including altars, grave steles, sarcophagi and building inscriptions. The Aquincum organ, found in 1931 on the site of Aquincum. It is the best preserved organ from Antiquity. Collection of stone relics in the colonnaded lapidarium around the old museum building. Each year the Aquincum Museum offers a whole-season program. It hosts a traditional Roman spring festival with theatre performances and gladiator shows. Floralia, held usually around the end of May, has become a popular event. The ruins of the legionary fortress where Hadrian was stationed as tribune with the legio II Adiutrix and later as governor of Pannonia Inferior are located some 3 kilometres south of the Aquincum Museum. The remains of the eastern and southern gates of the legionary fort as well as the baths and the military amphitheatre are visible. The remains of the southern gate (porta principalis dextra). The remains of the eastern gate of the legionary fort. The Thermae Maiores, the baths of the legionary camp. The military amphitheatre of Aquincum, located in the Obuda district. It was built by the Legio II Adiutrix around 145, during the reign of emperor Antoninus Pius. The Aquincum Museum is open year-round, but closed on Mondays. The Archaeological Park is open from 1 April to 31 October. The “Hadrianus MCM” exhibition runs until 31 October 2017. History of an Ancient Career‘ exhibition in Budapest. As always, an informative and expansive submittal. And certainly pleased to learn some of your superb photographs were included in the exhibit; an honor both well earned & deserved.